How amiable and witty this is, its wit as dry as the clicking of a clock. Insert joke here: Blank is easy; comedy is hard. One may be able to quickly compile a list of great books, but great comedic books would take more time. Wodehouse, yes. Russo’s Straight Man, yes. Peter De Vries, yes. Heller’s Catch-22, of course. Sterne’s Tristram Shandy, definitely yes. 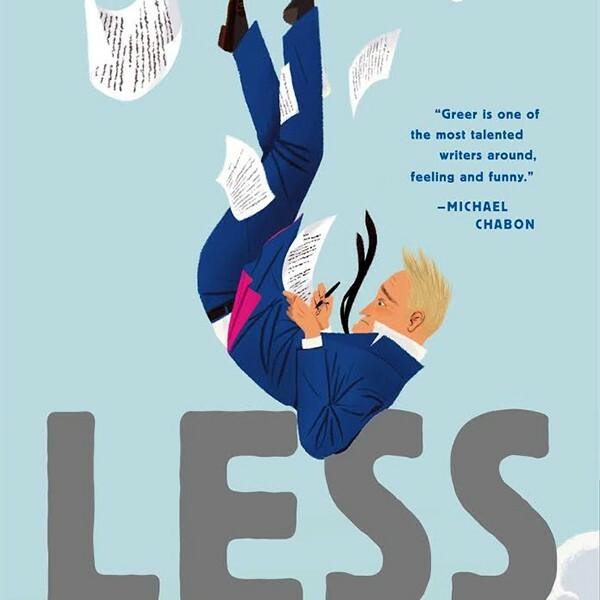 Add Andrew Sean Greer’s newest novel, Less, to this august group. I love funny; it’s a rare commodity, even in the works of our best writers. Furthermore, I love novels about writers — John Updike’s Bech books, Anthony Burgess’ Enderby series, Philip Roth’s Zuckerman novels, Powell’s monumental A Dance to the Music of Time — so this little tale hits me right in the heart. Following Arthur around the world is like living inside his Jiffy Pop brain. He is droll and affable, while inside he seethes with self-hatred, self-doubt, and a desire to know what it’s all about. Is 50 really such a liminal signpost that he keeps moving across international time lines to avoid what catches us all up eventually? We age. If age is only loss, how much less life can Less tolerate? His name is well chosen, of course, symbolic, ironic, useful in many of the book’s best jokes.